We are in the midst of March Break madness around here but as busy as our little beavers are keeping us this week, there is a stack of books that are begging us to come hither and we just don't have the willpower to keep them on the bookshelf till the kiddies go back to school next week! Don't forget to enter our giveaway for your chance to win your choice of one of the books featured on this month! I will let you in on a little secret about the uber-sophisticated Lily Lemontree-I love children's books! In a few short pages, children's books have the ability to transport us into magical worlds and fantasy lands in a way that you would be hard pressed to come across in a book catered to adults. I search out colourful covers with enchanting illustrations and I can usually tell by those delightful covers if the book is one that will find its way home with me. This illustrated 'biography' of the iconic Audrey Hepburn, written by Margaret Cardillo, was one of those books I couldn't leave the bookstore without. Instant 'like' turned into love as soon as I started going through its pages and realized this was just the right 'story with message' to hand over to my nine year old daughter who like every other little girl, occasionally struggles with self-acceptance of all the differences that make each one of us wonderfully unique! "It’s hard to believe life for Audrey Hepburn was ever anything but smart clothes, quirky expressions, and wistful gazes into the eyes of Cary Grant, but Cardillo makes a strong case to the contrary. 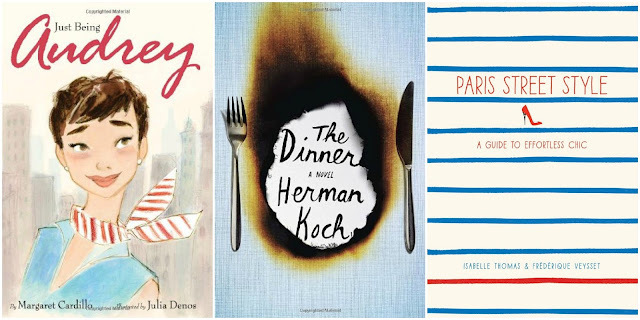 Growing up in WWII–era Europe, Audrey wanted only to be a dancer, but the other girls made fun of her physical hurdles: “She was too tall, her feet were too big, and her neck was too long,” and “her eyes seemed too big for her head.” Young readers will get the message: these were precisely the traits that made Audrey an iconic beauty as an adult. In short order, she was spotted by entertainment heavyweights for her je ne sais quoi and quickly catapulted to fame. Denos’ soft pastel illustrations cut just the right Audrey outline (complete with flapping neck scarf), and fans will especially enjoy picking out the movie roles depicted in a two-page spread of costumes. Her later humanitarian deeds are given their due, but it is Audrey’s simple kindness that is emphasized throughout." Having read review after review touting this book as 'mesmerizing' and 'ingenious', I had to pick it up and once picked up, I could not put it down till it was done! It's a summer's evening in Amsterdam, and two couples meet at a fashionable restaurant for dinner. Between mouthfuls of food and over the polite scrapings of cutlery, the conversation remains a gentle hum of polite discourse -- the banality of work, the triviality of the holidays. But behind the empty words, terrible things need to be said, and with every forced smile and every new course, the knives are being sharpened. Tautly written, incredibly gripping, and told by an unforgettable narrator, The Dinner promises to be the topic of countless dinner party debates. Skewering everything from parenting values to pretentious menus to political convictions, this novel reveals the dark side of genteel society and asks what each of us would do in the face of unimaginable tragedy. In my never-ending quest to get to the thick of all things French, I come across many books promising to share the secrets of the chic French ladies we all admire. Many claim access to tips from French celebrities and rich socialites (who are always lovely to look at but since most of us lack their bank accounts, aren't much help to the rest of us who can't afford a Louboutin or Hermes since we have families to feed and mortgages to pay) but this book, which just so happens to be released today, promises to give us a glimpse at stylish 'regulars', everyday women on the streets of Paris who work the chic just like their rich and famous counterparts! One city always seems to win the award for most-wanted style—Paris, where people walking down the avenues mix timeless and trendy pieces in a way that appears effortless. French fashion writers Isabelle Thomas and Frédérique Veysset break down the “je ne sais quoi” of Paris street style, describing the essential elements that should be in everyone’s wardrobe. Renowned experts on French style—designers, stylists, editors, and celebrities—also chime in to reveal their favourite accessories and how to create multidimensional looks and make affordable clothing appear luxurious. Starring both fashion icons and anonymous women met on the streets of Paris and richly illustrated with hand-drawn sketches and Veysset’s striking photographs, Paris Street Style is an inspirational fashion guide that will allow you, no matter where you are from, to cultivate an everyday style of timeless glamour, careless, easy chic—votre style français. I might have been late to the Downton Abbey party having just started following the series but I have become instantly smitten with all things Downton, like this cheeky cookbook dedicated to tasty treats that you might find your favourite Downton character nibbling on! "Nibble on Sybil's Ginger Nut Biscuits during tea. Treat yourself to Ethel's Beloved Crepes Suzette. Feast on Mr. Bates' Chicken and Mushroom Pie with a room full of guests. With this collection of delicacies inspired by Emmy Award-winning series Downton Abbey, you'll feel as sophisticated and poised as the men and women of Downton when you prepare these upstairs and downstairs favorites. Each dish finds its roots within the kitchen of the grand estate." Mention the name 'Lilly Pulitzer' to anyone and the first things that might pop into mind are floral shifts, tanned Preppies and the sun-kissed good life, all elements that we have come to associate with the famous moniker. 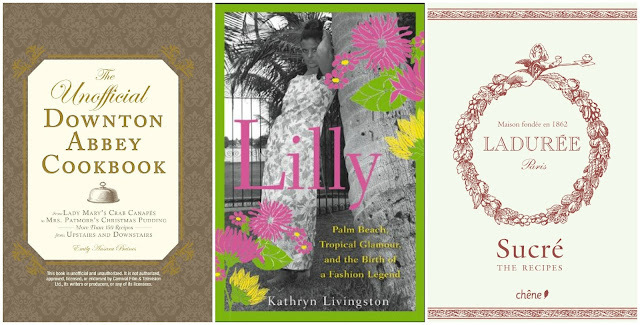 This book written by Kathryn Livingston, takes us past the visions of Palm Beach blondes lounging by the pool to uncover the personal trials and tribulations of the American style icon and her branch of the famous Pulitzer family. Today, Lilly Pulitzer's iconic brand of clean-cut, vibrantly printed clothes called "Lillys" can be spotted everywhere. What began decades ago as a snob uniform in Palm Beach became a general fashion craze and, later, an American classic. In contrast to the high visibility of her brand, Lilly Pulitzer has largely kept her tumultuous personal story to herself. 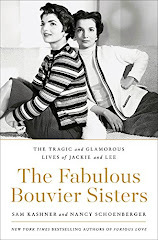 Bursting forth into glossy fame from a protected low-key world of great wealth and high society, through heartbreaks, treacheries, scandals, and losses, her life, told in detail here for the first time, is every bit as colorful and exciting as her designs. The name Laduree has become synonymous with the delectable macaroon but who knew there was so many more delightful confections that the famous tea-room had to offer! For those of us who haven't a trip planned to any of the big cities that are lucky enough to have a Laduree in their midst, this book gives us the opportunity to try our hand at any one of its over 100 recipes! "The story of Ladurée started in 1862 when Louis Ernest Ladurée opened a bakery in the heart of Paris at 16, rue Royale. In 1997 Ladurée opened a tea-room/restaurant on the prestigious Champs-Elysées, followed by other Parisian addresses and international tea-rooms in London, Dublin, Geneva, Monaco, Tokyo, Milan and soon New York. In this book Philippe Andrieu, the Pastry Chef at Ladurée, reveals 100 of the most famous Ladurée recipes, adapted for the general public. From the Strawberry Cake with Rose Choux Pastry to Pistachio Financiers and the world-famous macaroons in all their variety, this icon of French “art de vivre” is brought to life in a pallet of pastries the colour of powder pink, light green, bright purple, and lemon yellow." We will be giving away one book from this months reading list to a lucky winner. 1. Leave a comment below telling us what is on your reading list this month or which book you would pick from the March's Reads list. 3. 'Like' us on Facebook and leave a comment for one entry (If you already 'like' us on Facebook, mention it in your comment to be counted as an entry). 4. 'Follow' us on Twitter and leave a comment for one entry (If you already follow us on Twitter, mention it in your comment to be counted as an entry). Contest ends on Thursday, March 21, 2013 at 11:59 pm EST and the winner will be announced on Friday March 22, 2013. I am re-reading Memoirs of a Geisha this month. I can't decide which I'd love more: the Lilly P. Book, Audrey book or the Downton cookbook. Such great options this month! I have been wanting to read the Lilly Book so so badly. Oh my goodness, I'm putting every single one of these reads on my list! I've put all of your selections on my reading list. Currently reading Austensibly Ordinary by Alyssa Goodnight. A time-bending journal offers Jane Austen's advice to a 21st-century woman. Long-time follower of your blog via GFC and the soon-to-be-eliminated Google Reader. I follow you on Facebook, too. Yes, I also follow you on Twitter. @cspod. And, no, I'm not a stalker. Thanks for the lovely giveaway and for suggesting these books. I follow n Twitter email and fb.I'm reading The Orchid House. I have to read Neurosonology for work. I would love to have the Downton Abbey Cookbook as a diversion. I follow through GFC...is that going to change in July when they get rid of Google Reader? Oh, your books are always so good! I am an avid follower. I think a good reference book to own would be Paris Chic.....to refresh whenever needed!